The cow is a helpful domestic animal. It is useful to the mankind. So we should protect such animal. We have provided essay on a cow in the different word limit. You can choose anyone according to your necessity. 1. A cow is a helpful domestic animal. 2. The Hindus worship it as “Gau Mata”. 3. It has two sharp horns, two ears, a big nose, two eyes, a long tail and four thin legs. 4. It eats grass, rice, husk, hay, vegetables and etc. 5. A female cow gives milk. 6. From milk, we make cheese, curd and sweets. 7. She gives birth to the baby calf. 8. It gives milk to the calf and takes care of it. 9. We use its dung as a manure. 10. We will take proper care of such animal. A cow is domestic and a helpful animal. It is as well called "Gou Mata" or mother by the Hindus. Hindus worship her as a god. 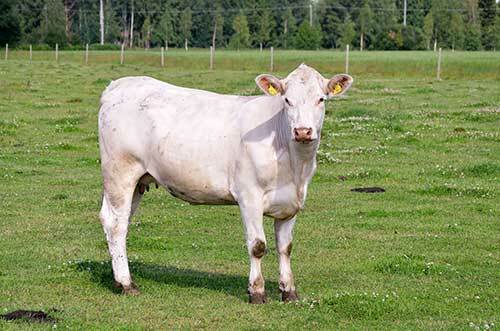 Generally, cows are white, brown, red or black in colour. It has two ears, two big eyes, one big nose, four thin legs and a long body. It eats soft grass, straw, grains, vegetables, hay and etc. She gives us milk. It is the best food for our body. Ghee, Butter, Cheese, Curd and different types of sweets are made from it. She is the real wealth of the farmers. So we should take proper care of it. No, another animal is so useful and helpful as a cow. The Cow is the very useful and a practical domestic animal. It was a pious animal for all the Hindus. Hindu peoples worship it as a virtuous animal. It is found nearly everywhere in the world. Indian cows are small and short in sizes, by in other countries, its body is long and large. It has a long face, four thin legs, a long tail, two sharp horns, two big eyes, two ears and a big nose. It eats grass, straw, hay, husk, and grain.She gives us nutritious milk. Its milk is very beneficial food for newborn babies and sick persons, From its milk, we make cheese, butter, ghee, curd and other different types of sweets are made from it. Its milk is useful for our mind, body and makes us active for the whole day. Farmers use male cow called "ox" to draws carts and plough their fields. Its dung is used as the fuel and manure. It’s urine used to cure different types of diseases. It is also very useful to us even after death. Its hide is used for making shoes, belts, boots, bags, leather jacket and etc. Its horns are used to make combs, bottoms, razors, and many other things. We all should save and protect the cow because it was the most useful and important for the mankind. thanks for that .mobile help me to lern more .